Madhulika Liddle has walked the streets of Delhi and reworked her way back to 1656, conjuring up a Mughal Dilli where each square inch has been relabelled for our benefit and sketched down to its carpeting and the artefacts that line the walls. This is a Dilli where marriages are sealed and stolen in turns for half a pot full of silver and the care of elephants is an art and a profession. The Mughal monuments that one has paced, admired, or seen in books or postcards are brought alive in their own time, and the people in their clothes and colloquialisms are seen walking the streets an inch away from the bridge of one’s nose. 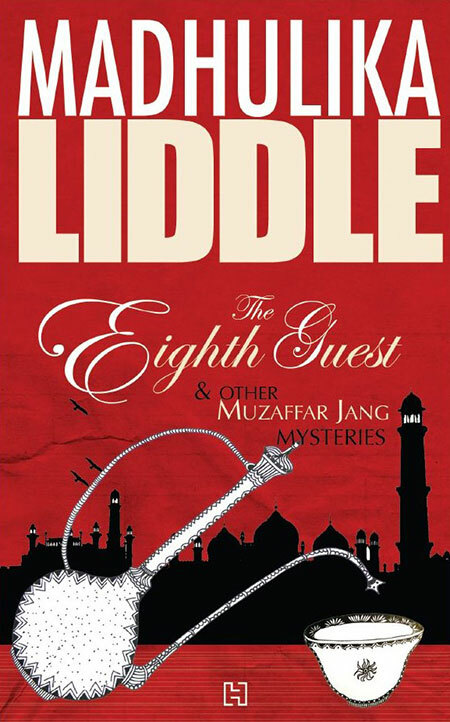 The Eighth Guest & Other Muzaffar Jang Mysteries book cover. Muzaffar Jang is an improbable man for his times, an aristocrat with a penchant for getting embroiled in the murky undertakings of Shahjahan’s Dilli. In Liddle’s previous novel, The Englishman’s Cameo, he unearths a conspiracy where a courtesan is murdered to hush up the embezzlement of taxes. The first story, The Missing Corpse, picks up where The Englishman’s Cameo left off. A murder appears to have taken place in the library, or as the Mughals called it, the qutb khana. And as the search for the corpse ensues, in the backdrop Liddle takes us through an intimate perusal of the literature at the time. The story catalogues their classics and travelogues, their intrigues and passions. Each cameo unravels not just a mystery, but stills from Mughal times. Every story chronicles another layer of existence, weaves more detail into the fabric of the world Liddle attempts to reconstruct for us. Muzaffar stands apart from the rest of the milieu, mingling with people from all walks of life. Liddle sneaks in social commentary now and then, but it’s seamlessly wound into the rest of the narrative, and not jarring as opinions tend to be. It’s obvious that Liddle’s book has painstakingly been put together, with attention to historical and aesthetic detail. The world she brings back to life has never failed to fascinate, and Muzaffar Jang’s adventures are just another way to decode the Mughals, i.e., through the trouble they tend to land themselves in. Though the book is no literary masterpiece, it manages what it sets out to do, to tell Mughal murder mysteries with aplomb. These historical resurrections are definitely worth reading on a lazy day. By Priya Savoor · Written by Meenal Baghel, the book ably documents the disappearance and murder of Neeraj Grover.